If you cannot make it to New York for this week’s Tribeca Film Festival, you can experience some of the films and most of the highlights via your computer or mobile device. The Tribeca Online Film Festival, presented by founding partner American Express, offers the TFF experience across digital platforms, allowing domestic audiences to view select feature and short films for free, including four world-premiere features to be streamed just after their TFF theatrical premieres. Audiences across the country will get front row access to the exclusive Festival content and hear filmmakers and industry leaders talking about the future of the industry as TFF’s 11th edition runs concurrently in lower Manhattan from April 18 to 29. 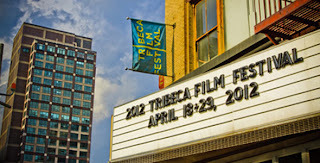 The 2012 Tribeca Online Film Festival offers film enthusiasts new avenues to experience the film festival. Audiences will get to vote, via www.tribecaonline.com, on the best online feature and short, with winners receiving a total of $16,000 in prize money. Winners will be announced at the Tribeca Film Festival Awards on April 26. There will also be a social voting competition, based solely on popularity: the number of “likes” that film accrues on the Tribeca Online Film Festival film detail page. The feature film and the short film that drive the most Facebook likes on the page will each receive a separate $500 prize. Winners will be announced on April 30.